A good film with a careful balance of comedy and poignancy. Green Book tells the true story of Italian-American nightclub bouncer Tony ‘Lip’ Vallelonga (Viggo Mortensen), who takes on the job of driver for concert pianist Dr. Donald ‘Don’ Shirley (Mahershala Ali). Not only is Tony responsible for getting Don to every concert, but also he must help Don to make it through his tour of the Deep South unharmed, as he is an African-American and this is the 1960s. When the audience sees Mortensen embracing the stereotypical sloppy, less-educated Italian-American image and how this is juxtaposed with Ali’s educated, refined, classically trained persona, one would be forgiven for predicting a feel-good story of an unlikely friendship forming due to the close proximity and shared experiences of two unlikely souls. This is only further supported by the listing of Peter Farrelly as writer-director, for out of this brain also came the likes of There’s Something About Mary and Dumb and Dumber. However, the slap-stick style that the Farrelly brothers are known for never dilutes the importance of this story of racial profiling and prejudice. Perhaps this is because a writing credit is also given to Nick Vallelonga, real-life son to Mortensen’s character. Vallelonga’s inputs also make for an intriguing interpretation of the use of Italian-American stereotypes, which Mortensen utilises for the majority of laughs that the film produces. With a focus upon the African-American experience, it is less obvious that other minority groups within American society are also largely generalised in this film, the Tony we first meet might as well be one of Fat Tony’s henchmen from The Simpsons. This may be because the image of big, shouting, Italian families eating copious Italian food, feels harmless as a stereotype because it insights a sense of homeliness and familial love. However, the danger is to cast aspersions, be they seemingly innocent or otherwise. Yet, with Tony’s own son on the writing team, one feels that what we see, must actually be vaguely like what the real Vallelonga household looked like. Be that as it may, it makes the opening of the film feel very formulaic: here is the protagonist, a diamond in the rough, who will learn and grow from his experiences with the refined teaching of the sophisticated but snooty, pianist. Yet, the film is able to rise above this sense of inevitability it seems to initially establish for itself. There are two key elements that help Green Book to achieve the almost impossible task of elevating beyond the predictable. Firstly, the expert performances of both Mortensen and Ali. Despite being given dialogue and direction that is, at times, indicative of slap-stick humour (old habits die-hard for Farrelly it would seem), Mortensen delivers a performance that offers moments of light, comedic relief to contrast the more intense dry wit of Ali’s extremely self-composed performance. Comedy is not a genre readily associated with Mortensen, but when his lines land with the audience, the laughs are enjoyable without guilt or coercion. Why one may feel guilty for laughing in this film and the second, perhaps more important, reason why Green Book was a worthy winner of the 2019 Golden Globe for Best Motion Picture for a Musical/Comedy, is its core subject matter: racial discrimination and prejudice. The film takes its title from a genuine travel guide that was produced at the time which listed hotels, restaurants and sights that would offer African-Americans a “vacation without aggravation”. From the moment that Don hires Tony and his tour location is revealed, there is a worrying sense that something bad is going to happen. This comes from the comments of other characters such as the manager of the Record Label which represents Don; he gives Tony the Green Book and warns that his duties as driver also extend into being hired muscle. The focus on the gentle progression from professional acquaintances into friends is periodically halted by moments of brutal, honest, insight into Don’s experience of the Deep South. For instance, Tony leaves Don safely checked into a Green Book recommended motel, only to receive a call later that Don went to a bar, alone, that wasn’t in the Green Book. Throughout the film, Don’s encounters of the prejudice appear to escalate and become more taxing upon the character. This, alongside continual dialogue from Tony about the desire to get the job done and leave the Deep South as soon as possible, give the sense that the film is building to a crescendo; a definitive encounter with potentially horrifying consequences that could make this film have to appear with a trigger warning. However, this moment doesn’t come in the way expected. Ali’s portrayal of Don is as task orientated, particular and continually self-aware. One initially thinks this is to create an obvious contrast between the two male characters. However, what the audience comes to learn is how Don has felt the need to alter his behaviour in order to fit into society. Not only does the racial discrimination come from the local residents of the Deep South but even those who claim to be fans of Don’s music; as we see one household Don is the honoured guest of for the night, refuse to let him use the lavatories inside. Thus, the restraint Don holds himself with is not just for comedic contrasting but also a sad indication of the position the society of the film put people of colour in. Don does not want to be seen in any way to cause trouble, for the film suggests that the police will not care who started it but rather racially profile those involved and so he continually has to accept the ignorant prejudice of those around him. This is until his last concert. Rather than the crescendo arising from a moment of violence, this film progresses towards Don no longer accepting the racial discrimination around him and refusing to allow the injustice continue. 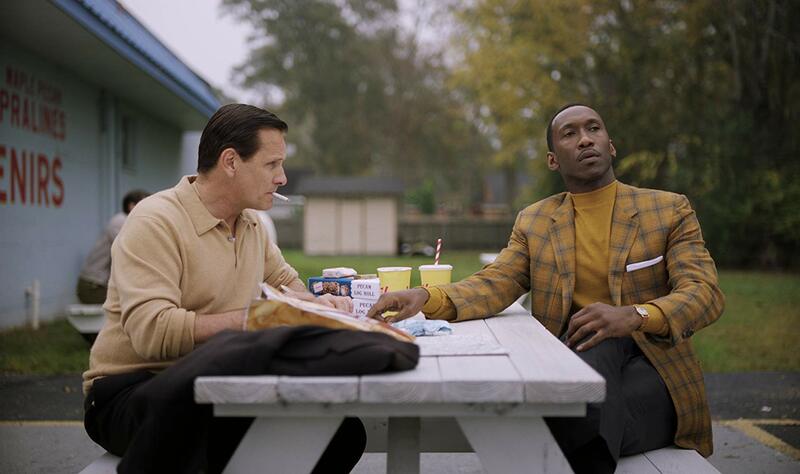 Green Book has been criticised for suggesting that Tony is Don’s saviour, losing the potency of portraying the African-American experience by creating a white hero figure to save the day. However, this doesn’t feel the case by the end. It is Don who takes the final stand in the film and dictates his own experience and treatment for himself, not Tony on his behalf. Green Book does not make the mistake of suggesting that one interracial friendship has the power to end racism, nor does it undermine the African-American experience by sugar-coating incidences of prejudice. Rather, it is a screenshot into the friendship of two men, brought together because of racial discrimination, but who progress beyond this to form a genuine, lifelong friendship. Green Book, directed by Peter Farrelly, will be released in the UK via Entertainment One on the 30th January, certificate 12A.